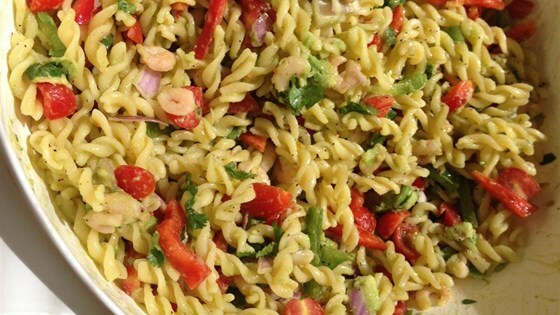 "A fresh springtime pasta salad perfect for a Cinco de Mayo celebration." 1Marinate shrimp overnight with 1/4 cup lime juice in a large bowl covered with plastic wrap. Drain shrimp. 2Heat shrimp in a microwave-safe bowl until they are bright pink on the outside, about 6 minutes. Allow shrimp to cool. 3Bring a large pot of lightly salted water to a boil. Cook cellentani in the boiling water, stirring occasionally until cooked through but firm to the bite, 12 minutes. Drain, then rinse with cold water until cool. 4Mix shrimp, pasta, avocados, grape tomatoes, red onion, and cilantro in a bowl. 5Whisk olive oil, 1/4 cup lime juice, garlic, Worcestershire sauce, dry mustard, salt, and black pepper in a bowl until dressing is well mixed. 6Pour dressing over shrimp mixture; toss to coat. Chill before serving.